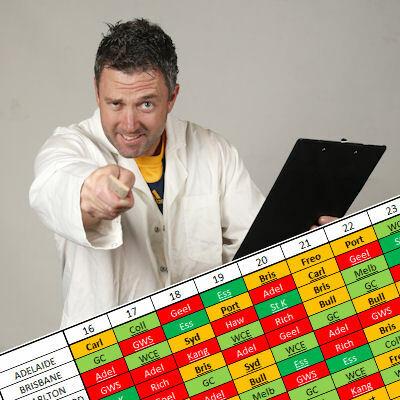 With only 6 trades left… you need to use them wisely and Cal has a colourful table to help. Round one of finals has come and gone. With two trades to burn this week, it’s very important that you shape your team perfectly for the last three rounds. Now is the time to be glancing ahead. Who will you have in the tough GWS game at the end of the year? Do you have too many Geelong players? Or on the flip side, who will you have in your team from the Crows or the Power? They play the Eagles and the Suns in the last game of the year and now is the time to load up on these guys… if you can make the Grand Final. The Eagles and the Suns have given up the most points in the last three weeks. As the table clearly shows, the Power and the Demons have a great run home from here in. The top targets from these teams are easily Max Gawn who has hit some form after two scores of 140 and 113. Michael Hibberd has continued to impress with an average of 110 in his last three and Clayton Oliver carries the same average after he had 105 and 128 in his most recent games. Melbourne have finished their travelling games for the year now and as they stay home in Melbourne for the last three, their run from here on, is pretty nice. More midfield time means that Robbie Gray should one again be considered. He’s averaged 104 in his last 3 games and had 112 last weekend when the Crows gave them a drubbing. The thing with Robbie is… even if Wingard comes back in soon, he’s next three games are easy and even if he does sit forward… he still should bag a couple of goals as well. For more information as to how this table works and what it all means… click right HERE on this bad boys for more information from the original article. so according to this table, i should go fro zorks over duncan? or go the safe option with Gibbs as my last mid spot? Duncs might get suspended, wait for MRP. So Ryder or Gawn a better option to go from Grundy? Warnie unpacks the important Fantasy info from the fixture announcement. The pre-season games will be played over two weeks in February and March.